The Bf109F was introduced at the end of 1940 and was probably the best fighter aircraft in the war at that time. It initially had the same DB601 engine as the late build E series but in a much more streamlined and revised airframe. The main production versions were the F-2 and F-4. The F-2 had the DB601 from the late E series and was armed with an engine mounted 15mm cannon and two 7.92mm machine guns in the nose decking. The F-4 featured a more powerful DB601 engine and the cannon was upgraded to a 20mm weapon. When the engines in the F-4 were cleared for maximum power, the aircraft could exceed 400mph. 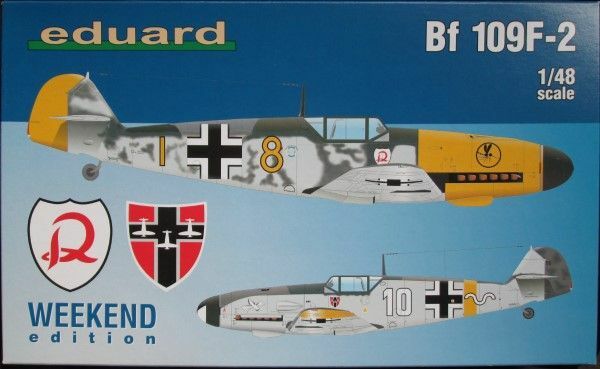 The F was considered by most Bf109 pilots to be the best balanced of all the Bf109 variants and was the Luftwaffe's main fighter in 1941-42. Eduard are a Czech based manufacturer famed for their model accessories. They have in the last few years released a successful range of kits. 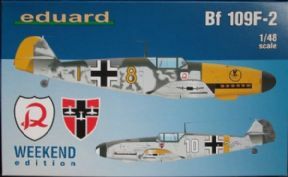 The Weekend editions contain the same plastic kit parts as the Profipacks but without the extra mask and etch parts.There are markings for 2 Luftwaffe aircraft.